Swiss watchmakers are not having a good time. Global exports of Swiss watches plunged 9.3% compared to the same month last year, the biggest monthly drop since 2009. The alpine country's watchmakers were hit badly by sluggish sales in Asia -- exports to Asia declined by 21.4%. Sales to China tanked 40% in July. And it's not likely to get better any time soon. The weaker yuan is making imports more expensive for the Chinese. On top of that, tumbling Chinese stocks are forcing many Chinese to think twice about their spending habits. The recent Chinese anti-corruption campaign is also biting into luxury goods sales, as officials have been banned from lavish spending. Sales to Hong Kong were down 29%, and to South Korea by 20%. Even the United Arab Emirates posted a decline, with customers there buying 30% less worth of Swiss chronometers compared to last year. The watchmakers are also facing new competition in the smart watch industry. Exports of luxury watches worth more than 3,000 francs ($3,115) declined 12.3%, while those worth between 200 and 500 francs ($208 to $520) slid 14.5%. Gold watches and those made from other precious metals were the worst hit. The strong Swiss franc is making the life of exporters more difficult. Switzerland decided to remove its currency peg on the franc in January, sending the franc soaring against other currencies. 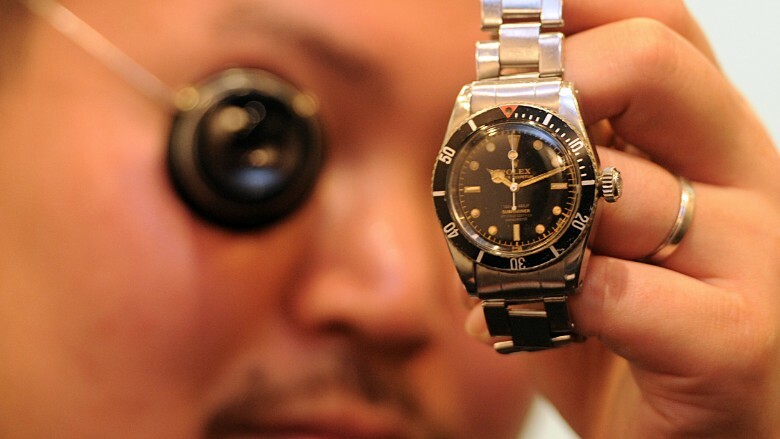 Watchmakers like Rolex, TAG Heuer and Swatch do most of their design and manufacturing work in Switzerland, and saw their costs rise in the last few months.